Each year a group called the CBMC puts together a popular, powerful event in the Raleigh, NC called the Triangle Leadership Breakfast. Today marked the 19th anniversary of this breakfast that draws approximately 400-500 participants each year. The purpose of the breakfast is to invite businesspersons to a gathering where they will hear a great message from a notable speaker that seeks to inspire individuals and organizations to make their world a better place with the talents and gifts they’ve been given. This year’s theme was “Living Authentic Leadership.” TigerHive Creative Group was blessed to be able to sponsor a table and invite others to this event. As a Christian business owner myself, this certainly inspired me knowing that a business leader of that magnitude was so proudly and boldly sharing his faith as part of his business identity. In a world where it almost seems, at times, that Christians are encouraged to hide their faith at work, here was one of the key members of the Coca Cola community. What a refreshing and encouraging start to my day. But, the good news doesn’t end there. As Frank began to speak, I learned that Coca Cola Consolidated brings those same Christian values deep into their workplace. 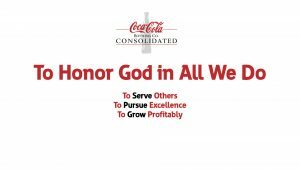 Coca Cola Consolidated incorporated a chaplain service into their business some years ago. Yes, a chaplain, at a private company. While they were a bit apprehensive at what the community feedback would be, it turns out that the outcome was nothing less than outstanding. In an interview with Capital Chaplains, Robert Pettus, Vice Chairman of Coca Cola Consolidated shared that Coca Cola had studied the costs and benefits of a workplace chaplaincy program and concluded that they more than pay for themselves in terms of lower turnover, higher morale, and healthier staff. By way of example, Pettus shared that some union employees—who happened to be a group of single mothers—approached him and said that, if tough economic conditions meant the workplace chaplaincy program might have to get cut, they were willing to give up other benefits instead so as to keep that one. In thirty years of work in human relations, he had never heard such an offer. 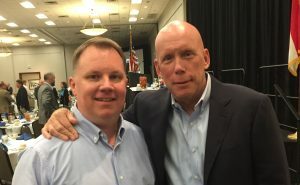 Frank went on to share how the chaplain program had began to heal his fellow co-workers in their marriages, their addictions, their faith and countless other areas of life. Turns out that bringing God into the workplace helps the workers and the workplace quite a bit. The Good News doesn’t end there. Frank went on to talk about a ministry that he and his family are personally involved with called With Open Eyes. With Open Eyes is a Global Missions Organization that “…accelerates the sharing and teaching of the good news of Jesus Christ to the unreached and underserved peoples of the world.” The following video is just a brief sample of the important work they do. 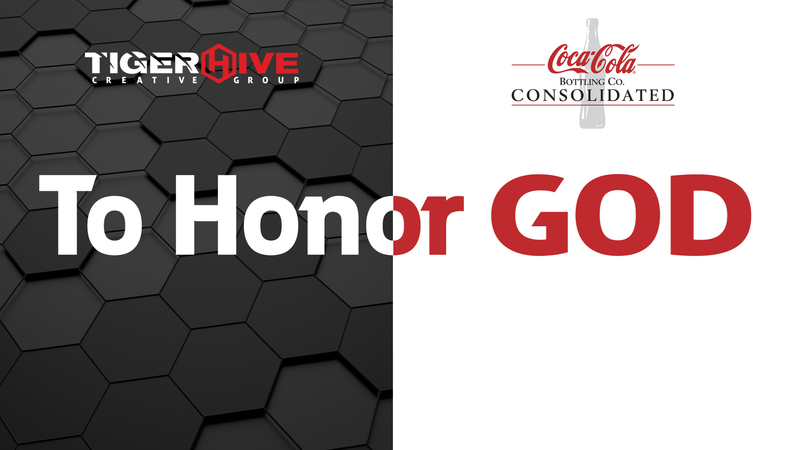 And last, but certainly not least, I learned that Coca Cola Consolidated had a missions statement very similar to ours that starts with the same three words as ours: TO HONOR GOD. To Honor God in All We Do. To Serve Others. To Pursue Excellence. To Grow Profitability. 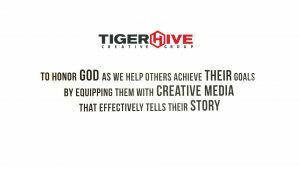 To Honor God as we help others achieve their goals by equipping them with creative media that effectively tells their story. When my wife Melanie and I discussed a mission statement for our company, we bounced a few versions around but nothing seemed to fit until we put God at the beginning. So, with a bit of trepidation in my heart, I made that statement public a few years ago. Since that time I’ve received far more encouragement than I would have expected and virtually no controversy about putting God at the center of what we do. Little did I know that someone else, a giant in business, Coca Cola Consolidated, had already begun to pave they way for businesses like ours. 1. To give a huge “Thank You” to Frank, his family and the Coca Cola Consolidated team for openly, boldly and appropriately putting God in the center of their business. 2. To encourage you to do like Frank and I have: Put God first. Don’t be fearful but be inspired and craft a mission statement that puts God’s will at its core that will drive a Godly corporate culture. Put God at the center of your life and your business and use the talents and gifts He gave you to honor Him. Contrary to what you may think, there are many, many opportunities to legally put God in your business in ways you may not be aware of. If you’d like some direction on how to legally bring God into your business, check out t-Factor, a website put out by Coca Cola Consolidated that tells you how to do their very thing. I don’t know about you, but the next time I have a Coke, I’m definitely gonna have a smile to go with it. Thanks, Frank.